Ozi Okaro, a children's book author, fashion designer, and entrepreneur, almost gave up her dreams of creating her own line of African girl brands as she didn't initially reach her business goals. But thanks to Oprah's O Magazine, her own brand of dolls eventually gained customers and increased sales! In early 2015, Ozi Okaro launched Ikuzi Dolls, a collection of dolls that represent "the different and gorgeous shades of Black beauty." 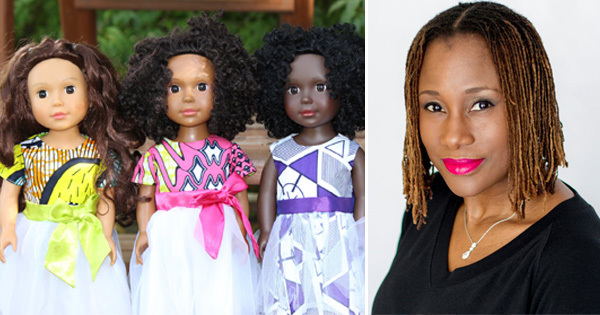 She was inspired to create dolls for her daughters -- one dark-skinned and one light-skinned -- so they could have dolls that look like them. After some time, Okaro realized that putting up a business and actually keep it going is not an easy task. Late 2015, she started a Kickstarter campaign for four weeks to help her with the funds for the production of inventory but she only raised $6,000, 17% of her $36,000 goal. "I was going in a little blind," Okaro told ROI-NJ. "Afterwards, I realized you have to build up a following and really get people rooting for you. I didn't have that yet." It was her friends and family who supported her. She told Black Enterprise, "It's funny how people come together for you when they believe in you." Within three weeks, she raised $25,000 from them and her own savings. Little did she know that a huge opportunity would come knocking in the form of Oprah's O Magazine. Ikuzi Dolls got invited to be featured in the May 2017 issue of the magazine after one of the editors stumbled upon her website. When the issue has been released, orders immediately doubled. "We started seeing an increase in orders," she said. "Nobody knew about us before the feature and that put a spotlight on us." Yet in its early stages, Okaro doesn't only dream of growing her business. She most especially wants to inspire kids to take pride in their heritage. The word Ikuzi is, in fact, an Igbo word for "to teach" and each doll wears African print dress. "I hope that our dolls will help young girls learn to love themselves and be proud of who they are and what they look like," she told Atlanta Black Star. "I want to inspire them to celebrate their African heritage/roots. Providing girls with our Ikuzi dolls that look like them, I hope will nurture a future where young Black girls will never be ashamed of the tone of their skin and the kink of their hair, regardless of what anyone may tell them."